Reclaim Your Saturday Mornings: Save Time Cleaning with the Bathroom P - E-Cloth Inc. Which room in your home do you feel needs the most attention? Is it the kitchen, the dining room, the living room the bathroom…the list goes on and on. For us, it is definitely the bathroom. The bathroom is a high-traffic room that lends itself to messes all too easily. There’s a lot of moisture, so it’s the perfect place for bacteria to flourish. If you’re like me, childhood Saturday mornings were spent scrubbing and cleaning. You knew that Mom expected no fun until chores were done. 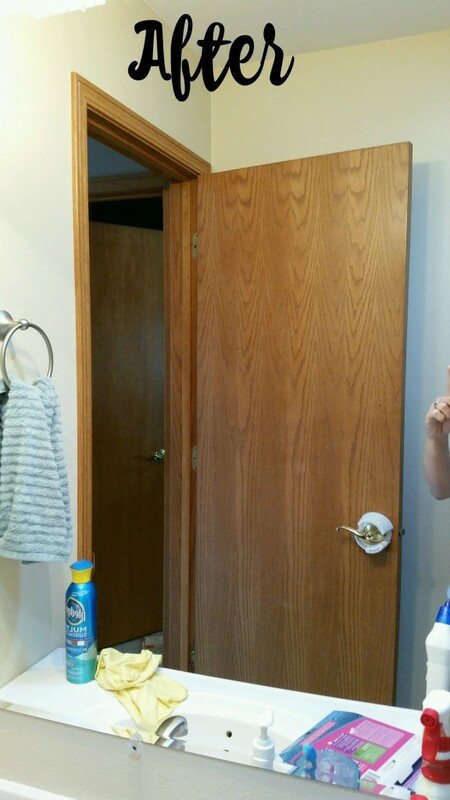 Well, look out, Mom, because cleaning the bathroom just got quicker and easier! Keep reading below and see how Charlene, from Thinking Outside the Pot, and her daughter cleaned and polished their bathroom in no time. HINT: To save time between cleaning days, keep a Bathroom Pack handy for daily wipe downs. Simply rinse under hot water and then hang to dry for the next day. At the end of the week, just throw the cloths into the laundry. The Saturday deep clean will be a thing of the past. Have any of you heard about E-cloths? They are microfiber towels that clean with just water. I had heard about microfiber towels that clean with just water but I was a little skeptical. How can a towel and water clean better than a chemical cleaner? E-cloth has a complete assortment of high-performance, task-specific cleaning cloths for every room in the home. I received the E-cloth bathroom pack, and was so excited to put them to the test. Our bathrooms can be the dirtiest room in the house.By using these great e-cloths it will leave your bathroom shiny, smear and streak free. The trick with e-cloth is that they attract, cut through, lift and lock in grease, grim and bacteria. Have you ever used Norwex products? I have not, and this is my first experience with E-cloth. If you would like to compare the two products here is a link to compare. if you are just interested in E-cloth products here is a link to follow to find out more. Now on to the dirty work.. cleaning my kids/guest bathroom with E-cloth’s Bathroom Pack. I had a little helper. My Chloe loves to help me clean the bathrooms. Chloe even goes and grabs the bathroom cleaners we use when I say lets clean bathrooms. I told her they were not needed today. 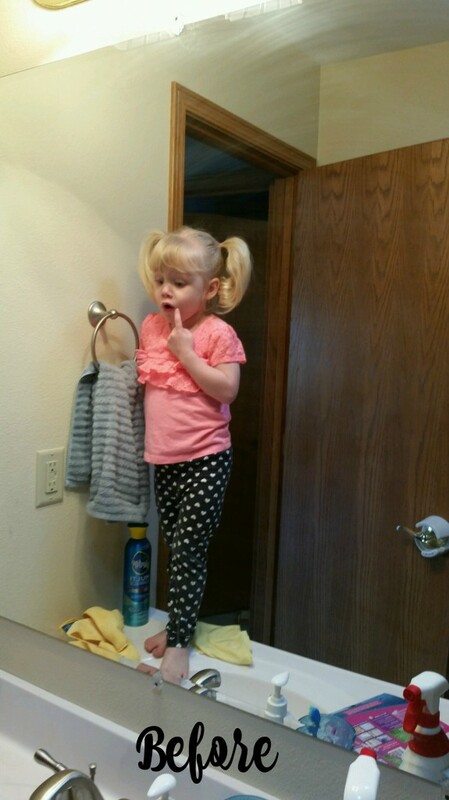 She was amazed at how dirty the mirror was in her bathroom. Whenever I have cleaned my bathrooms mirrors with cleaner and a normal wash rag they are left smeared, hence the smears on the top of this mirror below. After using the glass & polishing cloth from the bathroom pack my bathroom mirrors are smear free! 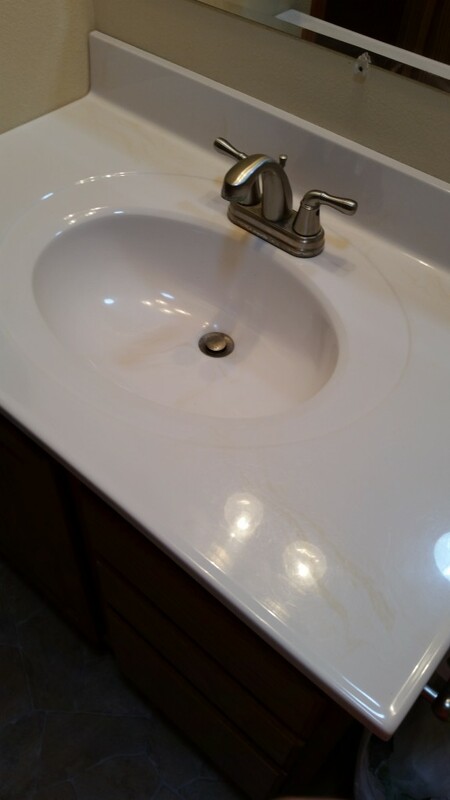 This is the after picture after using the bathroom cloth on my sink. We have extra hard well water at my house, so it leaves lots of messes on the bathroom sinks. E-cloth’s bathroom cloth came to the rescue though. Look how shiny it made this sink! Are you excited about how clean E-cloths made my bathroom as I am? If you would like to purchase and check out all of E-cloth’s products head on over to this link. For the bathroom products check out this link. I encourage you to join E-cloths email list.You can join by following this link, and sign up is a the bottom on the web page. They promise to only send emails a couple times a month to let folks know about E-cloth’s promotions and you can opt out at any time. E-cloth will never sell your email addresses and will only use it for internal marketing.